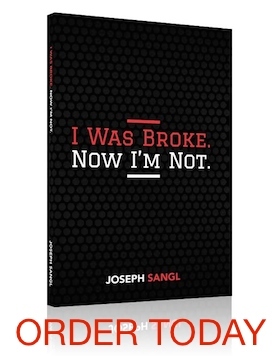 Last month, I wrote that I ordered more copies of I Was Broke. Now I'm Not. Last week, I received that order of books. I have to say I was stunned. STUNNED. It had been about two years since Jenn and I had become debt-free, and it was becoming very clear that we needed to go teach this personal finance stuff full-time. I really felt compelled to write a book that shared our journey out of debt and into financial freedom. That last line I just wrote is FUNNY. I mean laugh-out-loud HA-HA FUNNY. I had never written a book. How does one write a book? What about copyrighting? What about barcoding, LCCN, and all of that stuff? What about the editing? Not to mention the formatting, editing, and PUBLISHING! I was totally intimidated. I remember that Jenn and I made the trip down to NewSpring to visit Perry, Ken, and friends for New Years weekend. Perry and Ken had starting doing this new thing called blogging. I quickly realized that this was a way for me to start getting my thoughts written down on paper. At that time, I did not care if anyone read this blog. It was simply a tool for me to get my thoughts down on paper to possibly use in a book some day. Fast forward two years later to January 2008. I took a HUGE leap of faith and self-published the book – I Was Broke. Now I'm Not. Let me break down what "self-published book" means. It means that I paid cash to a book printer to print this book. In other words, a publisher did not lay out the cash for me. Jenn and I had to lay out the cash. Lots of it. We took a chance. We took a step of faith. Fast forward to today and why I am so STUNNED. This week I received the same amount of books that I ordered in January. When I stacked the new delivery of books next to the first shipment, it DWARFED the first set. Why? BECAUSE SO MANY PEOPLE HAVE BELIEVED IN THIS CRUSADE! I am blown away, humbled, and very honored that so many people have invested in this crusade by purchasing a book. I am blown away and humbled by the kind words that have been shared by people whose lives have been impacted by what they have learned and applied through the book. For all who have invested in this crusade, thank you. I am overwhelmed that I get to do this stuff for a living.